Under the grated black truffle are leeks with cheddar. Atoboy tilts Korean, but not too insistently. Originally Junghyun Park dreamed of becoming a chef in a fancy hotel. But then the Seoul-born cook realized he was more interested in Korean flavors then French or Italian, and he became the chef de cuisine at the Michelin-starred Jungsik. Chef Junghyun Park comes by to say hello to the five of us at my first Atoboy dinner. My friend Rina was our guide to the food we shared at that first dinner in July of 2017. After he and his wife Ellia opened Atoboy (A-Toe-Boy), Rina, a Korean friend, led us there. We discovered that the $39 three-course meal with a side of rice offered a choice of dishes somewhat larger than the typical little banchan that might accessorize a classical Korean meal. The asparagus of summer had an intense greenness. Cooked mushrooms are layered in a queue and served in a tasty puddle with salmon roe. Since we were five that evening, we tasted at least a bite of most everything – the spicy beef tartare, lotus root sprinkled with black and ivory sesame seeds, and sparkling spring asparagus in a creamy dressing – one fat tip for each of us. A queue of mushroom slices lined up in a creamy yellow sauce with a flotilla of salmon roe. There was lotus root with tangles of jalapeño and sprinkles of black and white sesame seeds. There was octopus at the first dinner with a savory green sauce. It was a season for corn and summer greens. The octopus was cut into chewy rings and dribbled with a citrus coulis. There were little saucers of classic Korean pickles. Potato chips fluttered on fat chunks of fried chicken anchored in spicy peanut butter. We ordered bowls of “seasonal” rice for $2 extra. At some point in the dinner at Atoboy, little dishes of classic kimchi will arrive. Chunks of pork with leaves of onion sit on barley. I recall chunks of pork jowl with barley and curls of cipollini onion. And meaty New York strip. Dessert was cheesecake with a filling of strawberry mousse and berry puddles under a scattering of mint leaves. I enjoyed the sense of discovery. One surprise after another. But I never felt an urge to go back. Strawberry cheese-cake mousse with puddles of berry sweetness is dessert in July. Then last week I asked my friend Lauren to choose a restaurant and I found myself sitting at one of Atoboy’s spartan tables, across from her husband, Ryan, as our server helped Lauren select a sake. The minimalist space has concrete walls and floor with tables for four on one side and two tops on the other. Chunks of pineapple are pickled like kinchee. Fans have described this space as brave new world, minimal and smart. But the greige concrete floors, stern walls, and bare wooden tables strike me as making do in a bomb shelter. An architect pal who loves the look suggests I am narrow-minded. A tub of paper napkins, chopsticks and soup spoons sits ready for instant needs. That’s a plus since lately I find myself forced to ask for serving spoons everywhere we go. Toasted seaweed crackers come with drinks to launch the meal with a crunch. The three-course dinner is now $46 per person, still pretty reasonable. Like a small banquet planning committee, we debate and finalize our choices – three from each course, with an amuse of toasted seaweed crisps in tiny bowls to start. Not that one can control the flow. Dishes will come as the kitchen sends them, the second course arriving while you’re still eating the first. Savory beef tartare with chili oil, cilantro and pineapple is draped modishly on one side of the plate. Slices of raw yellowtail topped with radish sprawl in a puddle of kombucha. Photo by Lauren Bloomberg. I am spooning up my third of the leeks with black truffle, cheddar and buckwheat when the yellowtail in kombucha arrives, pretty in pink like a baby girl’s nursery. I like my raw fish sliced thinner. Beef tartare with the sweetness of pineapple, spicy from chili oil, is served stylishly draped over one side of a plate. Are you old enough to remember Veronica Lake? Beef short ribs are served with anchovy, kimchi and potato chips. Photo by Ryan Durkin. Midway through the three courses, lobster is tossed with blood orange, cayenne and pearl onion for $10 extra. Ribbons of jalapeño are scattered across three long fritters: shrimp wrapped in endive and sautéed with a South Korean fruit called chopi. The shrimp is delicate and sweet. Hearts of palm and seaweed sit in sea urchin custard. And for our $10 extra, impeccably cooked lobster is joined by blood orange, cayenne and pearl onion. A thick chunk of tender mackerel comes in a deep bowl with green chili sauce and scallions. A large chunk of perfectly-cooked mackerel with its skin still on and a melted scallion on top sits in a spill of green chili. Soybean paste flavors pork belly chunks with enoki and fennel. Anchovy and kimchi intensify the salty taste of Galbi, beef short ribs. 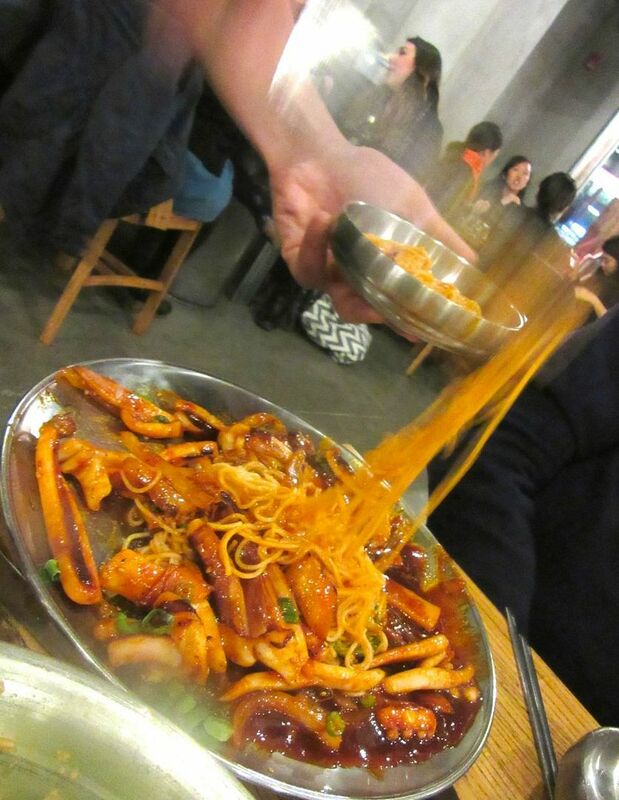 Fried chicken, a $23 extra, comes with squirt bottles of spicy peanut butter and the pungent gochujang. A pyramid of just-fried chicken is a $23 extra. I dip my chunk in spicy peanut butter sauce and smile. Peanut butter was a constant of my childhood that I don’t dare keep on my shelf decades later for fear of losing control. Sweet frozen ice is layered with burrata and broken walnuts. My pals favor the panna cotta with grapefruit and ginger crumble but I’m supposed to avoid grapefruit. So we settle on sujeonggwa, sweet cinnamon punch, frozen into a granita and ladled over burrata with chopped walnuts. Weird yes, but delicious. Delicately cooked shrimp are wrapped in endive with chopi fruit. Atoboy’s endive-wrapped shrimp will never be as essential to me as the Caesar salad and antipasto at Fiorello. The savory tartare and the peanut butter-smeared chicken won’t draw me back every few weeks like the Shanghai soup dumplings and shrimp-stuffed chicken at Red Farm. But please don’t underestimate my enthusiasm. I definitely send you there for adventure. A few hours in the concrete bunker in NoMad is like a detour to some foreign land, not slavishly Seoul perhaps, but full of intriguing surprises. 43 East 28th Street between Madison and Park avenues. 646 476 7217. Monday through Saturday 5:30 pm till 9:30 pm. Sunday 5:30 pm till 9 pm.